Colleen Dunn Bates is wonderful. We talk books, we talk publishing, and what I most want to do is get to have coffee and pie with her in person. Her Prospect Park Books (celebrating it's tenth year!) produces wonderful , critically acclaimed nonfiction, fiction--and these books succeed like crazy. And she deeply cares about her writers. In one conversation, I mentioned this novel I loved, Gina Sorell's Mother's and Other Strangers, and Colleen, overburdened with work, heard the passion in my voice, and took a look--and bought the novel a few weeks later! I'm thrilled to host her here. Thank you for everything, Colleen! 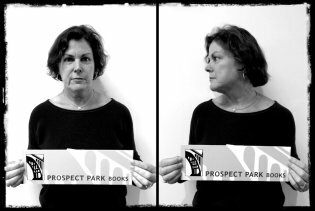 When and why did you start Prospect Park Books? How has it changed since its inception ten years ago? Prospect Park Books is a California native, publishing beautiful print and digital books with wit, creativity, and intelligence. We focus on fiction, humor, cooking/food, and regional titles, and we work with authors, designers, and artists who are outside of the New York mainstream. I started Prospect Park Books in my house ten years ago. (Side note: not in Brooklyn—I live in an historic neighborhood of Pasadena called Prospect Park.) In the ‘80s and ‘90s, I was the packaging editor of a series of guidebooks published by Simon & Schuster, and I also wrote tons of magazine articles and a few nonfiction books. In 2002, Crown published a book called Storybook Travels that my friend Susan LaTempa and I wrote. We were so proud of that book—still are—and were sad to see it fizzle from neglect, bad luck, and some poor choices. The experience left me a little bitter, but I loved books, so eventually I decide to publish books myself and try to do a better job with and for debut and midlist authors than the big guys were doing. PPB has changed dramatically since those early days. I really had no idea what I was doing back then, so I learned by doing and failing. My first book, an unusual guidebook called Hometown Pasadena, succeeded far beyond my (modest) hopes, and it gave me the hubris to keep going. I learned some hard lessons in the following couple of years, not the least of which was the nearly impossible challenges involved in publishing guidebooks, which date very quickly. I now think of Prospect Park as two businesses: The first phase lasted four years, and the second iteration is six years old. Six years ago, luck and circumstance and friendship led me to publish my first novel, Lian Dolan’s Helen of Pasadena, and it did very well. I’ve always been a big fiction reader, but until then, I felt that I had no business publishing fiction. But suddenly that’s what I was doing. At that same time I was going through breast cancer, which was pretty overwhelming. I had a teenager at home, another kid in college, a business I was running alone, and a year and a half of surgery, chemo, radiation, and more treatments. But thanks to a wonderful husband, great kids, and an amazing and large community of friends and family, I got through it all very well. And then we became empty nesters, so I hurled myself, with tremendous post-cancer energy, into growing Prospect Park. About that same time, an old friend, Patty O’Sullivan, joined me, and together we created a business plan, got some funding, committed to publishing more titles (including more fiction), and moved our distribution to Consortium. Patty moved on to new adventures recently, but we remain great friends, and I’m grateful for how much she did to help grow the business. Patty once described us as a “nano Random House,” which was apt. We are quite unusual for a small press. Typically they have a tight focus: perhaps poetry, or fantasy, or sustainable living. It would have been much smarter, business-wise, to just publish one kind of book. But I find that boring. I want to publish what I love and what I know. I read popular and literary fiction and mysteries and humor, and I was a writer/editor in the food world for many years, and I love my hometown of L.A.—so therefore I publish fiction, mysteries, cookbooks, humor, and books about L.A. A crazy-broad mix for an indie, but there you have it. Prospect Park Books does such wonderful books--and they get acclaim in the NYT, The Washington Post, and make the Best of the Year lists--and they also happen to have fabulous covers. This is amazing in a tough publishing climate! How do you do what you do? With an inherent (if now tempered) optimism, a lifelong drive to be around and to connect smart, talented, thoughtful people, tons of hard work, and no doubt a stiff shot of insanity. Really, it’s a nearly impossible business for those of us who are not nonprofits and therefore can’t get grant money to help with overhead and staff. But I’ve given this ten years of my life, and goddamnit, I’m going to make it work! In truth, it's all about the people. It’s always about the people. The books are wonderful because talented people write them and talented people design them. My job is to find those people, assemble great teams, make the books as good as they can be, both editorially and physically, and do everything I can to get them the attention and sales they deserve. Without deep pockets. How hard could that be? The heartbreak is the tough publishing climate. I’ve had worthy books sell well, and make the L.A. Times Bestseller list, and win awards… and I’ve had equally worthy books struggle to get the audience they deserve. There are just so damn many books out there. I recognize that I’m part of the problem by adding to the stacks littering the hallways at Library Journal. But I’m in too deep now to stop. Plus I believe in every book and every author. Tell us about "being arrested" by Booklist! The story is hilarious. And see the mugshot above. I publish mysteries, and they’d been getting well reviewed in Booklist, because I’m blessed with such damn fine mystery/crime writers. They were doing a feature on editors of mysteries, so the writer included me. It was an honor, because Prospect Park is so small. And it was fun to play along with the theme, which included providing front- and side-view mugshots of me. Two things. First, the search for funny. It is so very hard to write funny, and nothing makes me happier than a smart, engaging book— fiction or nonfiction— that makes me laugh. I’m all about a good laugh, which you might not know from some of the more serious books I publish. (But I love all my children equally, really I do.) It has been so much fun to publish such witty authors as Lian Dolan, Anne Flett-Giardano, Jennifer Worick, Judy Rothman, Christopher Noxon, Karen Rizzo, and Phoef Sutton, and I am always on the hunt for a new writer who has the rare gift of writing funny. Second, I’m obsessed with my business. Nothing is more entrepreneurial than a small press. Unlike tech, we’re not getting VC money to pay for staff, and we’re selling a product that can and is returned for full refunds for basically forever. So like a cactus in the Mojave, we have to look for every clever way we can to survive. I’m always working, always thinking, always trying to figure out how to make it succeed. So many people have this fantasy of life at a small press, that you get to sit around and read and talk to authors and leisurely debate cover designs. We get to do that for about 15 minutes a week. What books are coming up next? I’m so glad you asked. This spring and summer have such a lovely mix: the big, gorgeous cookbook Little Flower Baking, by Christine Moore; the gripping and important novel This Side of Providence by Rachel Harper; the sixth Mas Arai mystery, Sayonara Slam, by the gracious and beyond-wonderful Naomi Hirahara; and the paperback launch of Christopher Noxon’s wise, witty, and tremendously entertaining debut novel, Plus One. Coming in the fall-winter season is an equally diverse mix. First up is Bertrand Court, the second work of fiction from Michelle Brafman, whose debut Washing the Dead we published last year. She’s such a talent, and as you know, this new book is so beautifully written, and I have very high hopes for it. Next is the paperback edition of Alan Hruska’s excellent legal thriller Pardon the Ravens, which we published in hardcover last year; an adult coloring book (yes, jumping on the bandwagon) for my current hometown, Color Pasadena; a fun and fast-moving crime thriller, Heart Attack & Vine, the second in the Crush series by the very talented Phoef Sutton; a terrific debut novel that you’ve already read, A Narrow Bridge, by Joyce Gittlin and Janet Fattal; and a humor/gift book called Talk Like a Californian: A Hella Fresh Guide to Golden State Speak. We're having lots of fun with that one. And even more beyond that, including Gina Sorell’s remarkable debut novel, Mothers & Other Strangers, which you told me about! It’s already well into 2017 in my world. And I’m happy to say that 2017 is looking very good indeed.